Super Icon, the developers behind Life of Pixel, have returned with Best Buds vs. Bad Guys, a co-op run-and-gun that that features a pair of friends sucked into their video gaming system during a storm. The game takes place across 11 themed worlds inspired by themes of classic gaming (not unlike Life of Pixel), running the gamut of bloody factories, spooky graveyards, a number of fantasy worlds, and even a world filled with pastries and candy. Players have access to a huge array of weaponry that becomes available as they play, representing some standard armaments as well as more cartoonish weaponry like banana napalm. 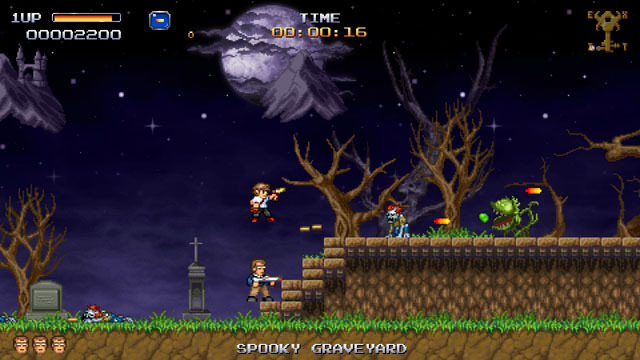 The game is presented in a colorful 16-bit style, with numerous references to classic games. The game is headed for PC, Mac, Linux via Steam this month, and releasing later on Wii U, Xbox One, and Vita.